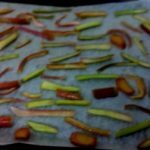 Being a chocolatier, I feel like I ought to write about Mothers Day or about Easter, but this week I am inspired to write about Rhubarb…. 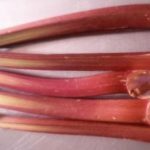 yes – Rhubarb! I just love it. How did I not know this sooner?! I used to enjoy the odd rhubarb crumble but never really thought beyond that. Then a couple of summers ago I discovered pink lemonade – yum yum! Did you know pink lemonade is made with rhubarb? Anyway, a lovely customer of ours mentioned rhubarb and brought some to us at the last Liverpool Food and Drink Festival (Thanks Johanna!). The idea was to candy it, but unfortunately my candying skills didn’t really work so we left it on the back burner (not literally). I forgot about it for a while and then saw a tweet from Claremont Farm saying fresh Rhubarb in stock. So when I went in to deliver some chocs last week I picked up some Rhubarb. It looks quite innocent, but I think the leaves are poisonous? I candied it successfully this time – Hurrah!! – then proceeded to use it in our chocolate. Place the sugar and water in a pan and heat . Take the pan off the heat and throw in the rhubarb – give it a mix so that all of the rhubarb is coated in the sugar syrup. 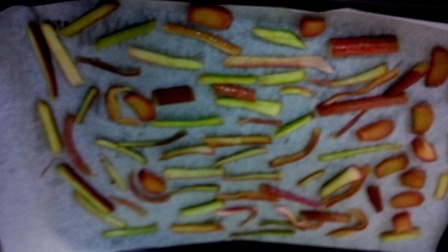 Take the rhubarb out and place onto baking trays lined with parchment paper. Make sure none of the pieces are touching each other. You will be left with liquid that is a mixture of sugar syrup and rhubarb. It tastes delicious. 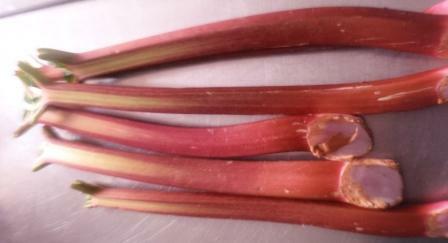 Not sure what to do with the rhubarb syrup yet – seems a shame to bin it – so let me know if you come up with an idea! Once cooled, place in an airtight container. Hope this works for you – let me know how you get on! PS – we have got easter eggs and mothers day treats for sale at our pop up shop in 12 Princes Parade on Friday 28th March as well as our online shop!